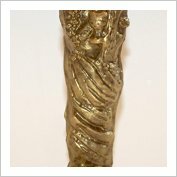 This is a slab version of the New Bacchus Chocolate Award Figure. This does also stand upright. Wrapped in clear cellophane and tied with ribbon. 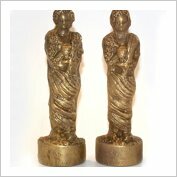 A Chocolate Award Figure based on the Roman God of Wine, known as Bacchus or Dionysus. Prudence was the Official London 2012 Chocolate Sculptor at the Olympic Park. This led her to research the ancient Roman and Greek Gods and she made them out of chocolate. This 20cm high solid chocolate figure can be used as awards at parties and events, to say thank you, and to note achievements or recognition. Each figure is hand made to order. Approx 160g of solid Belgian Chocolate. Dusted with edible gold colour. Presented in a clear cellophane bag and tied with ribbon.